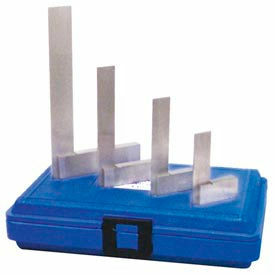 Squares Are Used For Multiple Woodworking And Metalworking Applications. Squares are constructed with aluminum, steel, plastic, wood and other high quality materials for long lasting durability and dependability. 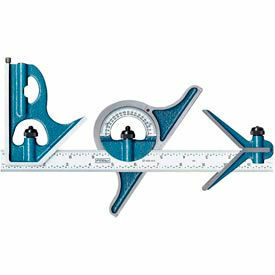 Variety of popular brands and types available to meet particular measuring needs, applications and budget requirements. Variety of types available to meet measuring requirements. Dimensions and color finishes vary per type. Quantity is 1. 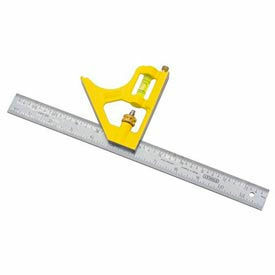 T-Squares Provide Proper Right Angle Measurements, Corner Cuts, Framing And Straight Edge Work. T-Squares are constructed with aluminum, plastic and other high quality materials with protective anodized finish for long lasting durability and dependability. Variety of popular brands and types available to meet particular measuring needs, applications and budget requirements. Unique rivet assembly, permanently bonds head to blade. Large, bold thermal-bonded black 1/8 inch graduations. Some models includes case for storage. Variety of types available to meet measuring requirements. Dimensions and color finishes vary per type. Quantity is 1. Protractors And Angle Measurement Devices Provide Accurate Measurements For A Variety Of Personal Or Professional Applications. Protractors And Angle Measurement Devices are made of carbon steel, stainless steel, satin chrome plating and other high quality materials for strength and long lasting durability and dependability. Fowler®, General Tools, InSize, Johnson, Mitutoyo, Stanley® and Starrett brands offer a variety of types to meet particular need, application or budget requirement. Include Digital Angle Locator, Digital Laser Level, Universal Bevel Protractors, Electronic Protractors, Universal Dial Protractor, Square and Round Head Protractors, Protractor and Depth Gauge, Angle-izer, Combination Measuring Set, Pitch and Slope Locator, T-Bevel, Angle Meter and more. Some models supplied with pouch or carrier for on-site use, safety and storage. 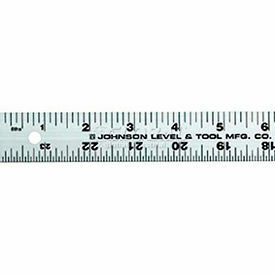 Straight Edges And Rulers Provide Accurate Measurements On Construction Jobs, Carpentry Projects And Other Commercial Applications. Straight Edges And Rulers are made of aluminum, hardened tool steel, chrome plating and other high quality materials for strength and long lasting durability. Variety of brands and types available to meet particular needs, applications or budget requirements. 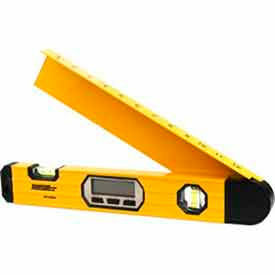 Designed for use measuring flatness and straightness and for marking. Metric versions available. Variety of types available to meet job requirements. Dimensions, features, color finishes and specifications vary per type. Combination Squares Provide Easy, Accurate Measurements Used For A Variety Of Work Applications. Combination Squares are made of aluminum, steel, cast iron and other high quality materials for strength and long lasting durability. Variety of brands and types available to meet particular need, application or budget requirement. Measurements are etched on blades for easy visibility and accuracy. Center head design locates center of round workpieces. Protractor head and square head designs used to measure angles. English and metric systems available. Variety of types available to meet job requirements. Dimensions, features, color finishes and specifications vary per type. Quantity is 1.